What is the difference between a scrum master and a coach? I get a lot of people asking me, “Jesse, what’s the progression? How do I evolve? How do I grow?” I get questions also from people asking, “Who should I hire? Who should I pick up? What’s … I mean, isn’t it the same thing?” That’s a good question. One of the frameworks that I like to work through is certifications, it helps structure the conversation a little bit. The Scrum Alliance has a growth path for this conversation. It goes from Certified Scrum Professional for scrum masters to Certified Team Coach to Certified Enterprise Coach, and it describes not just scrum master versus coach, but it turns out there’s two different flavors of coach that are out there; and we’re going to talk about the growth from one to the other to the final big kahuna, as it were. Here’s the first question I want to ask you, if you’re looking to grow or if you’re trying to figure out who to hire. Who is the audience that we’re helping? Who do you help? Scrum masters help doers. Scrum masters help a team of individual contributors work together to get something done. On the other hand, a team coach helps the people around them, managers, directors. Many times, you’re helping other scrum masters, and you’re helping them challenge their assumptions. Enterprise coach, senior coaches, are people that are challenging senior leaders. Maybe you’re also a master coach helping other coaches get good at what they do, and you didn’t realize that you were more evolved than maybe you thought. Who is your audience? Who are you helping? Then, once you talk about who, it also helps to think a little bit about the span of your coaching, the sphere of influence that you have as you’re going through this. Are you helping just one team then as a scrum master? That’s your span. On the other hand, an agile coach must be expected to be able to support multiple teams at a time, especially if they’re trying to work together and figure out how dependencies are evolving and what are the norms that are common versus the approaches that are specific to us. That’s not the same skillset, the same kind of span of the entire organization, the entire business unit. That would be an organizational coach, which is a different flavor. Scrum master to team coach to enterprise coach; different span, different range. To do that, you would imagine it takes different tools. You got to add some skills. Scrum masters, senior scrum masters, have got to be really good at that agile thing, iterating and incrementing, and scrumming, and combining, and daily stand-upping, and all of that stuff. Once you start talking about team coaching and being an agile coach, well, you’ve got to bring some professional coaching skills. That’s where you get into dialectic inquiry, where you get into powerful questions. Can you do that? Have you been trained in it? Have you got some skills to do it? That’s good, but it’s not enough if you need to challenge senior leaders. Senior leaders need some conversation around development, organizational change management, or organizational design. Those are some additional skills, hopefully, you’re adding to your toolkit. The bigger the span you have, the more senior the audience you have, the more tools you need in your toolkit. The thought after all that is, wow, that’s a lot. Where do we get those tools? Where should I reasonably expect to find candidates, coaches, scrum masters getting those tools, and the answer is out there in the real world. Get out there. Go talk to people. If you’re a scrum master, maybe go to a meetup. If you’re a scrum master, maybe go to a conference. Don’t necessarily just read a book. Maybe you do read but don’t depend on that. When you get to being a coach, I’m expecting you to be a member of the Agile Coaching Community. People should know your name. People should see you frequently at those events, but if you’re one of those people that has to drive a conversation at an executive level, if you have to challenge people on how they’ve structured their work chart, you better be bringing some thought leadership to the table. You better have a brand. You better be able to say, “Actually, Mr. CAO, I can talk to this because I’ve written two books on it,” or, “I founded the Nationwide Series, a virtual community on the conversation of remote agile work.” That is a thought leader in the community, probably not needed for someone helping programs of multiple teams, certainly not necessarily for just helping a group of people get together. You might want to consider this: “Have I put in enough years into this?” Scrum masters can start day one with no experience at all. Great. Would not be wanting that from a coach, would not be wanting to be coached by somebody who hasn’t heard a lot of stories, who can’t help me put things into a bigger context. The more senior the coach, the coach’s responsibilities, the more hard work I’m expecting them to have under their belt. That’s a framework to help you think about your own progression. Where are you in that? 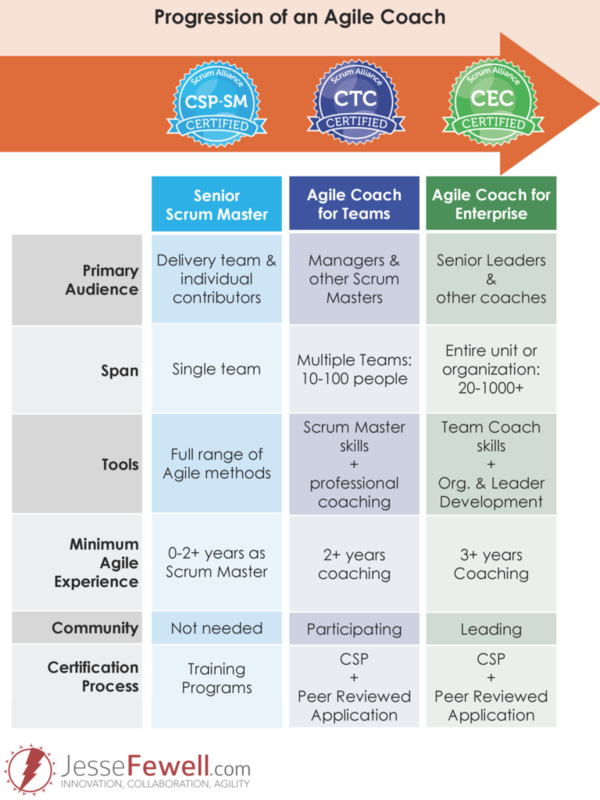 Are you a senior scrum master? Are you maybe helping multiple teams, going through a conversation with managers and other scrum masters? You’re probably coaching. You’re probably a coach, but, then, if you want to get to that level where you’re influencing an organization with senior leaders and you’re impacting work design, now, you can aspire to becoming one of those enterprise agile coaches. After reading that, what are your thoughts, comments, and questions? Hey Gary, I’m overdue to respond to your generous comment. I’ve seen leaders with zero agile experience jump into an SM role. They weren’t great, but those who were willing to embrace “beginner’s mind”, own their mistakes, and roll with the punches were “good enough”. Granted there are those I’ve seen fail miserably and drag a team down with them… but if a newbie is willing to try, I will only stop them if they have the wrong attitude. Fair enough? Jesse, thanks for sharing such valuable information. Very clear understanding about a scrum master and a coach.